It is about one and half hour driving from Senggigi to reach the two beautiful waterfalls that simply hidden in the rice fields and the hills at the foot of the Rinjani Volcano. The Waterfalls are located in Aik Berik Village, North Batukliang, Central Lombok, situated in a tropical jungle with lots of different trees and plants. From the entry of the park, you have to do the soft trekking for about 10 minutes to the first waterfall called Benang Stokel and another 30 minutes walking to the next waterfall called Benang Kelambu. 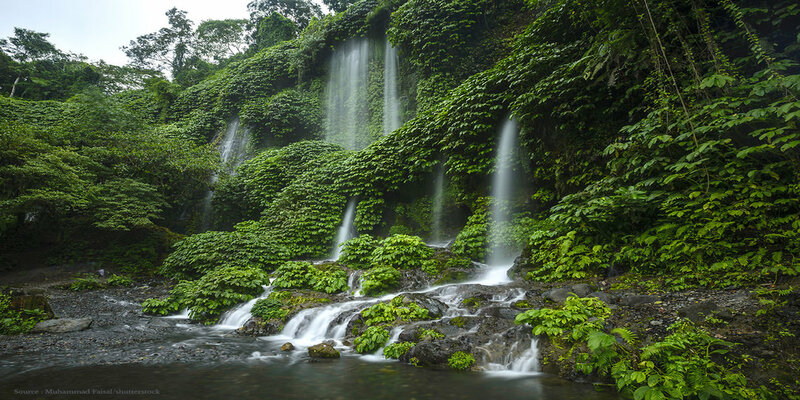 The name of Benang Stokel in local language means a ball of thread because the shape of the waterfall almost looks like a thread that has been tied to each other. Based on the folktales that goes among the villagers, the Benang Stokel Waterfall used to be a place for Dewi Anjani ( one of the Goddess and the gatekeeper ) to clean herself up before going back to the Rinjani mountain. The climbing track to Benang Stokel is a shorter track to go to Mount Rinjani compared with other tracks from Senaru, North Lombok or Sembalun, East Lombok, but the track is a bit precipitous for the beginner. After the trip to the twin waterfalls, then this trip continuing to Narmada Park to see a replica of the crater lake of Segara Anak. From there you will drive for about 35 minutes to Lingsar temple, the most important temple in Lombok where all Hindu’s come to worship before driving back to the resort. Additional person : IDR 150,000,- net per person. On The Way To The Islands You Can See Beautiful Panoramic Views Of The Beach And The Mountain Ranges.